The Canon Vixia HF R300 is a budget-friendly Full HD camcorder that offers the ideal combination of price and performance. 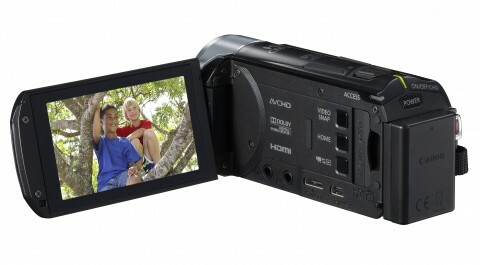 The HF R300 records in 1920 x 1080 high definition and has an SD/SDHC/SDXC memory card slot that supports up to 64 GB. With 64 GB SDXC card this camera can records almost 34 hours of SD video at the LP quality or almost 24 hours of HD video. 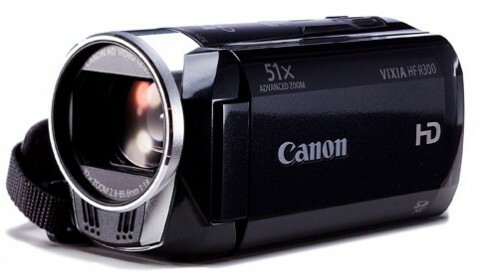 Canon HF R300 captures video in AVCHD (for best 1080p image quality) or MP4 (limited to 720p, but MP4 is convenient because all modern device can play it back). The Canon Vixia HF R300 has a new and more sensitive 3.28 CMOS image sensor and also has the Canon’s exclusive DIGIC DV III Image Processor. All new for Canon HF R300 (and for all R-series models too) is Intelligent IS with Optical Image Stabilization that allows the camcorder to automatically switch between stabilization modes for optimal image quality while recording. The Canon HF R300 also features a genuine Canon HD video lens with 51x Advanced Zoom, a 3.0-inch flat touchscreen LCD monitor, microphone terminal with manual audio level control and a lot of other great features. For now, Canon Vixia HF R300’s review from experts are not available. However, you can read some opinions about design and performance of Canon HF R300 on pcmag.com website.